Few months ago I have announced the proof-of-concept of the library to manipulate the browsers DOM objects directly from Elixir (here). Finally, first beta has been released! And of course it is available as a hex package. and more, like synchronous modal which - launched on the server side - waits for user input. Any suggestions, criticism, ideas welcome! What Frontend tech do you use for Multi Page App? How to append inputs for `Phoenix.HTML.Form.inputs_for`? How to update a content region in real time? Do I understand it well if I say that this allows you to basically ‘remote control’ what a user sees on their webpage? If this would be combined with a JS library managing a virtual DOM, we might even be able to write nearly all browser-UI management on the server, FRP-style! Yes, it does exactly this. You can manipulate the user interface in the real-time, from Elixir/Phoenix. What do you think about shourtcut method to toggle actions (delete or insert something or update with keep prevoous value)? Interesting, thanks for sharing the idea! Thanks! I’ll add it to my todo list!. This looks fascinating and could simplify code! A question though, how does it work with a shadow DOM (which makes custom elements internal parts invisible to normal DOM methods) as the site I work on is almost entirely Shadow Dom (which is faked on Firefox and such but a real shadow DOM on Chrome)? I was thinking about using intercooler.js mainly to get partial-page-rendering (alongside pushstate), but this seems even better. It will not work - on the browser side it uses normal DOM methods from jQuery library. Nice ! so I guess drab is not actually tied to having a DOM, that was my biggest concern about using with react-native. Thanks for the links, and for drab, it looks just awesome! But it still requires jQuery on the client-side, as it was easier for me to develop it in early sandbox/proof-of-concept stage. Removing jQuery is on the todo list, but not on the top priority for now. 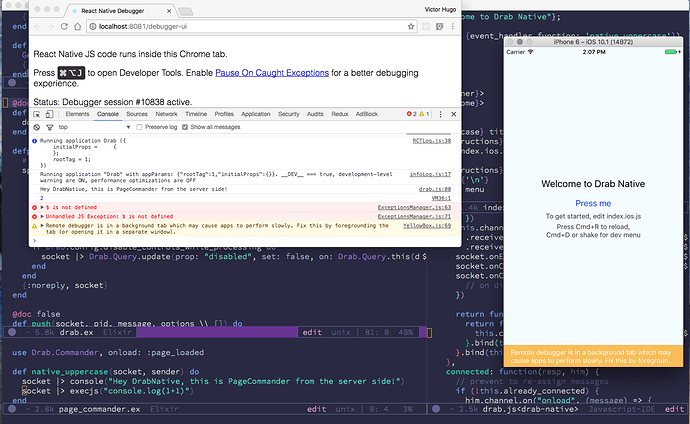 Still not commanding react properly but was able to execute a console log and a random js. the parts for connecting and sending events with payload.